The Overview: Japanese cleaning consultant Marie Kondo takes tidying to a whole new level, promising that if you properly simplify and organize your home once, you’ll never have to do it again. Most methods advocate a room-by-room or little-by-little approach, which doom you to pick away at your piles of stuff forever. The KonMari Method, with its revolutionary category-by-category system, leads to lasting results. In fact, none of Kondo’s clients have lapsed (and she still has a three-month waiting list). I have been an organizer all of my adult life, even going so far as to lists “organizing” as my strongest asset on job applications (as it turns out, all the jobs I’ve ever had have been optimal organizing jobs). 2017 is my year of Simplifying Life, which involves, you guessed it, organizing every aspect. So, when my library flashed an available copy of The Life-Changing Magic of Tidying Up in front of my face, I snagged it… Serendipity? I think so. This book was fun for a couple of reasons. One of which was that it allowed me to compare my organizing skill set against a professional. I’m delighted to report that I actually came away from it with several new great ideas and a whole new perspective on how to get rid of stuff. The book is packed with many great tips along with an interesting look into how the author developed the KonMari method over the years. Also – it was amazing to finally find someone who can talk about organizing and getting rid of stuff without advocating minimalism! I love stuff. I love MY stuff. I just don’t want to be buried under it. One of the best things Marie Kondo does is present her method with a clear order of operations for tidying (she uses the word “tidy” in the same way I would talk about organizing and getting rid of stuff). The idea is to ease you into the process by starting out with things that are easier to get rid of. #1 was clothing. This is already a revolution for me, because when I go through my stuff, I tend to always begin with keepsakes – the most difficult things to part with. Anyway, her method involves gathering every like-item of each category in one place. It’s important that you don’t worry about organizing until you’re done sorting items into either keep” or “discard”. One point of contention I’d like to briefly note here is that she advocates throwing things away, whereas I’m more inclined to donate. She does bring up donation as an option, but more often than not describes throwing away dozens and dozens of bags of items). Her method hinges on 1. using your ability to identify which items bring you joy and 2. your willingness to get rid of everything that doesn’t. This is the part I found most helpful. You see, most other methods I’ve researched advocate identifying which items to discard. Whether it be “get rid of 1000 items over the next year” or “find one item a day to get rid of”. They put more emphasis on quantity over quality that IMO focuses on the negatives. Marie Kondo changed my perspective by conveying that what’s important is not what you discard, but what you choose to keep. With the other methods, it gets to a point where you’re hounding your house, looking for things to discard (I can attest that it can get really frustrating). Kondo has her clients physically touch every item and spend a moment considering whether or not it sparks joy. While her and I don’t agree on every point within her method, this one at least was a home run. Speaking of not agreeing, the next category after clothing is books… Kondo is of the philosophy that if you buy a book and don’t read it right away, chances are you’ll never get around to reading it and it needs to go. The intention to read a book is not a good enough reason to keep it. BLASPHEMY! Now, I admit I get where she’s coming from, but I think this only applies to the average person and not us book-obsessed. Arguably, books are my life, and when you devour 60+ books a year, there’s a good chance you actually will get to a lot of the titles on your shelves (eventually). What if getting rid of the books you intend to read in favor of keeping just the books you are excited to read would actually make you feel lighter and more free? On one hand, being surrounded by books is one of my biggest joys in life, but (as any book lever can relate, that looming TBR can cause a ton of stress. I always enjoy what I’m reading, but much less when I’m focused on getting through my current reads because I’m impatient to get to my to-reads. Keepsakes: Kondo suggests going through keepsakes last. That way, you have a good handle and lots of practice using the KonMari method, and can more easily identify which things merit hanging onto. She claims that most keepsakes you don’t actually need to keep because the memories associated with them is already so strong, you won’t forget them after discarding the items. Thinking about my own keepsakes, I can definitely see how this is true – tossing that pile of rocks I have sitting on my shelf from my trip to Wyoming is probably not going to diminish my memory of the trip itself. This will be the hardest category for me because I’m incredibly sentimental about inanimate objects. I learned long ago that if I hold onto it for more than a month, that sucker ain’t ever leaving my house, no matter how trivial it is. Papers: this is one of the categories I disagreed with Kondo about. She says, aside from a few documents you have to keep like birth certificates and car titles, everything else can be disposed of. I don’t know if it’s a cultural difference, but this woman has clearly never been through underwriting while buying a house in the US. Those people require EVERYTHING. Kondo’s claim is that whatever you discard, you can always get ahold of again if you need it. When disputing charges on my Century Link bill, however, and there bill access section is conveniently not working, that’s when I wish I had a printout of them stashed away. I will admit that the vast majority of papers we hang on to our unnecessary, but for me, the ones I choose to keep are there for convenience and to alleviate possible stress later. It seems like anymore these days the less documentation you have to back you up, the more people screw you over. Or maybe that’s just me. That said, I still only have a small 2-drawer filing cabinet (hot pink, of course) for everything. Gifts: Kondo does a really great job trying to make you feel less guilty about getting rid of things you received as gifts. We all have them. And we hang on to a lot of them because we’re afraid it would hurt the person’s feelings if we got rid of them. I’m really horrible about this. My mom once gave me a bunch of socks she didn’t like, and I hung on to them for a couple of years before finally asking her if it was okay if I got rid of them. If it comes from my mommy or my husband, it’s really difficult for me to let go, even if I don’t like it. That said, when I do finally let some things go, I feel lighter somehow. Kondo’s argument is that the purpose of the gift was to make you feel appreciated by the gift giver. The item has already served its purpose, and what happens to it after that is the less important factor. I agree completely with that sentiment, and I certainly hope any gifts I’ve given weren’t held onto because of guilt. That said, just don’t let me know that you got rid of it – I gave my grandma a bird statue for her birthday one year and saw it sitting proudly on the table at her following garage sale a couple months later… Ouch. Stocking up: People buy in bulk and stock up on all sorts of things, and Kondo thinks this is most often unnecessary. Her argument is, by the time you make it through your items, most of them have past their expiration date and have to be discarded, anyway. It’s a much more intelligent use of time money and space to only buy the items as you need them. As I sit here staring at the six boxes of expired peppermint tea that I’ve been buying over the last few years every time I got a coupon, I can totally see her point. I’m going to throw away a ton of tea that I bought on sale, which means I essentially wasted $20 rather than “benefiting” from a savings of $3. There are a few exceptions, but generally, I find her argument to be valid. Humanizing Items: this is the final thing I didn’t quite see eye to eye with the author on. She says to treat each item like a person (that’s not exactly as she said it, but you get the gist). When you get home from the day and take off your shoes, you’re supposed to thank them for keeping your feet comfy throughout the day. When you get rid of a shirt, you’re supposed to send it off with the thank you for keeping you clothed all those years. I have a couple of issues with this (aside from the obvious). Primarily that doing something like this for every item in your house requires so much energy. I spend most of my day putting on a polite, friendly demeanor for coworkers and tenants, the last thing I want to do when I get to my home – a place where I can let that face down and just exist in peace – is have to treat inanimate objects like they’re people. The more minor issue is that, if I treat my things like people, I’ll never be able to get rid of them without feeling guilty, lol. To round out the KonMari method, once you have gone through everything in your house and decided what to keep, only then do you start the organization process. The key is making sure everything has a “home.” Right now I have lots of stuff in my house that doesn’t really go anywhere, so it ends up on counters, in cars, and shoved into random drawers. If you give everything a place, then the maintenance of this stuff won’t make you want to peel your face off (that last sentiment is mine, not the author’s). Overall, as this is one of my first forays into nonfiction (don’t worry, it will be one of my only), I found it highly interesting. 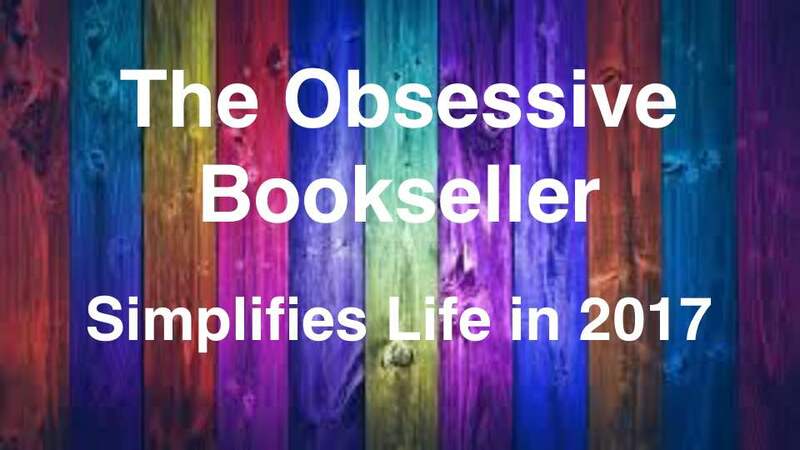 The Obsessive Bookseller definitely wants to get her life organized this year, and every little tip helps! I am chomping at the bit to start applying some of the methods I’ve acquired from Kondo to see if they really work, which I’ll definitely highlight it in future Simplifying Life posts (once my house is finished being built and I can dig into all my stuff – currently in storage). In any case, thanks for coming along with me on this organization tangent – I hope you picked up some tips LOL. I concur whole heartedly. I am glad that you went on to talk about thinning the mediocre out though. Sometimes book collect around us like dust bunnies and they need to be cleared out. Yes, her method definitely requires some tweaking. But even just thinking about the books I have, I know I’m hanging onto a bunch I’ll never read. I have lots of dust bunnies still haha. Have you tried thinning out your collection lately? It sure is a process. I’m so glad you were able to enjoy this more than I was! I couldn’t get into this book at all when I tried reading it a while back. I think I’m just too much of a pack-rat, so maybe I just wasn’t “ready” for it yet, haha. Her humanizing every little object drove me up the wall! Completely agree with your thoughts on books and papers. I love your idea of not going beyond 10 years of TBR! Thank you – yes, while I loved a lot of points in this book, those were two subjects I just couldn’t compromise on… especially books. ;P And the 10 year method really did work for me – I figured if I was so I’m excited to read it that it would take me more than ten years to get to it, there are probably going to be a plethora of other titles I’d add to my collection that would also take preference, so why hang on to it? I’m itching to do another minor downsizing soon because I think I still have way more than 10 years worth haha.